There are many over-the-counter teeth whitening options, and one type of readily-accessible whitening products is commonly referred to as a “paint-on” teeth whitener. Paint-on whiteners can be purchased over-the-counter and generally are less expensive and less effective than whitening strips or professional options. Paint-on teeth whiteners consist of a gel that is applied to the tooth using a small brush. Paint-on whitening gel hardens into a film that coats the teeth, and dissolves in the mouth. 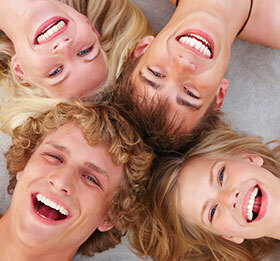 As with any teeth whitening regimen, it is wise to consult with a dental professional before use. Teeth whitening strips are thin, flexible plastic (polyethylene) strips with a thin film of hydrogen peroxide on one side. Whitening strip kits come with two types of strips: strips for the upper teeth and strips for the lower teeth. The whitening agent is applied by placing the strips across your teeth and gently pressing the strips into place to ensure contact with all your teeth. Teeth whitening strips are typically worn for 30 minutes a day, twice a day. The duration of treatment will vary.